LionSteel born in 1969 in the wave of the Maniago knives tradition. 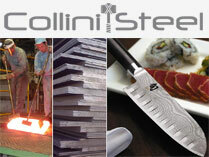 It was founded by Gino Pauletta and early specialized in contract manufacturing for other factories of cutlery. A few years after his wife, Cesarina Bazzo, became part of the company giving new life. They were well designed and put into production the first models of folding knife, with such models came to life even the brand LionSteel. Brand that comes from a stone sculpture of a lion, made by grandfather Gino, and from steel, a fundamental component of the knife. Leone and steel in English so they created the brand LionSteel. During the late nineties, as a result also the entry in the company of three sons Daniele Gianni and Massimo, the company has made the leap, establishing itself as a 'leading producer of cutlery. The introduction of information technology and CNC machines allowed us to improve the quality standards of new products. At this time the company has fifteen employees and is selling directly in all European markets and especially in the US. The philosophy of LionSteel is to produce knives in its factory, avoiding the maximum for products from third cutlery, and especially from the East. We are sure that the Made in Italy still has its weight and its own dignity.